Are you ready to go Live? Are You Ready to Click That Broadcast Button? One day last week one of my Easy Webinar clients and I were on and off a call that lasted a good part of the entire day. much of what I was doing that day to make things work for her. Spending around 4 hours total helping her. any questions that she should have. She froze. She focused on the technology…She didn’t start the event on time. As soon as this happened, I realized something. No matter what technology you are using, what medium of communication…if you cant communicate your message in the first place then you are unfortunately sunk. Well, she got 20 minutes in and simply canceled her event. She didn’t have anything prepared regarding a presentation and it fell flat. What is the moral of the story here? What did I take away? What did she take away? What should you take away? Now someone out there might have unique super hero skills to where theyÂ can wing it, but the normal mortal needs, at the very least, to have an IDEA of what they’re going to do and talk about no matter what the tech does. You have to keep your audience’s attention and have a presentation (or a plan) ready to go. A show ready to go. I am not saying this to scare you…but more so to prepare you. The technology should be 2nd to the actual presentation. Please remember that! enroll into my new coaching program LaunchStream. Â Click Here to Get On The List. the 4 steps to the event launch blueprint for increasing your event performance, process and most importantly revenue. FYI: Â This is a coaching program, different from my OnlineBroadcasts training. (OnlineBroadcasts teaches how to use Google Hangouts/YouTube Live for Broadcasting, where LaunchStream is a Coaching program geared towards improving and optimizing your SALES events and Launches. Â LaunchStream is Strategy BABY…and it is what adds a couple zeros to your event sales generation. To sign up for the earlybird list when we open up the program, click here. (Please be aware, this is a coaching program, so it is not cheap. I am only looking for students dead serious about their business and their success. Now back to this client. Remember, I am not picking on her…I am simply sharing the painful reality of things. 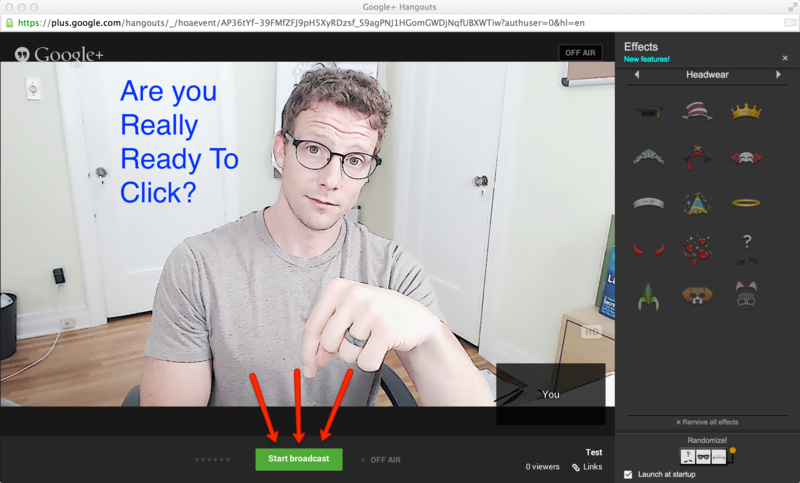 I’ve personally had terrible webinars and events..Sometimes you freeze…sometimes the software freezes. TO GO FROM 2 SALES TO 20 SALES…OR 4 SALES TO 40 SALES! open up enrollment coming soon. We’re looking at starting the training in about 2 weeks. take this stuff seriously, Register on the earlybird page! 2. LaunchStream (For getting one on one coaching specifically designed to examine your business objectives with events and give you a blueprint for optimizing your sales events, presentations and launches! 3. Finally, our ProducersCorner is our ‘We do the work for you’ Service. So if you want us to swoop in and help produce your eventsÂ as well as CREATE the event marketing funnel whether that be automated or live, we can do that! (Please note: Consultants and Coaches, we do have a partner program where we can do the work for YOUR CLIENTS and you can get paid for it.) Send me an email @ casey@easywebinar.com with inquires. Leave a comment below: Â Have you ever had an experience where you were unprepared? Did you feel naked from it? Exposed? Please share below! As Jason Fladlien is fond of saying “Fail to prepare then prepare to fail”. Steve Jobs was notoriously meticulous about his preparation so his presentations were prepared for weeks, scripted and rehearsed and re-rehearsed – both guys didn’t NEED to prepare…yet they did – which may just have played some part in their success. Why the experts make it look easy is because they’ve not only practiced A LOT, they also never get in front of a group, online or offline, without at least a plan and usually an organized and practiced presentation. Great reminder and blog post Casey. I mostly wanted to write to wish you luck on your adoption journey. Our child is now 12. The journey 12 – 13 years ago was both arduous and magical. She is absolutely the child of our heart and we know she just had to take a creative path to join our family! I’m am always happy to talk to and support other parents on their forever family journey. I stumbled through for another 10 – 15 minutes and then finally apologized to my attendees, and told them what was happening, and that I was going to need them to bail me out by asking me what they wanted me to cover in the training. I knew the subject matter cold, but I had too much info trying to get out at the same time and hit a bottleneck in my brain. Could Not Get Anything Out! LOL!!! So embarrassing, and So liberating at the same time! They started firing questions at me, and I took them through real time demos, visuals and examples to get them what they needed. The attendees raved about the webinar, even though I felt like 2″. Be relevant to your audience, answer their questions, send them away with what THEY came for, and it ALWAYS works out to the positive. Dave! Awesome stuff. Yes Jason F. knows exactly what his message is and who it is addressed to. It might look unscripted but knowing what you want to say takes a lot of preparation and practice. Jason, this is terrific insight. Based on what you experience, I would say that you were OVER PREPARED and then your mind was filled with too much stuff! I have definitely been there. Where I had been working on my slides so much that I was tired and had way too much stimulus. Great article topic…planning is key! Even after 20 years experience of teaching professionally in schools, university, private settings etc, you always have to be prepared- and online, I still use a basic script/outline with time slots. Teaching online is no different, even if you are running recorded events and have little interaction with your audience who will want to expand or discuss something during the event, you still need to ensure you keep to a timed schedule and logical sequencing of ideas- people have paid for a certain time slot or have made a time commitment.